1 of 1 In a large bowl, combine mango, pineapple, raspberries, blueberries, kiwi and honey. Stir gently to combine and set aside. 1 of 3 In a medium-size bowl, whisk together the yogurt and 2 tablespoons honey. Chill until layering. 2 of 3 Place coconut in a small nonstick skillet. Heat over medium heat until toasted, stirring occasionally, 3 to 5 minutes. Remove from heat and cool. 3 of 3 Spoon 2 tablespoons fruit into bottom of an 8-ounce glass. Top with 1 tablespoon yogurt and a little coconut. Repeat layering one more time, finishing with coconut. Garnish with a cookie. 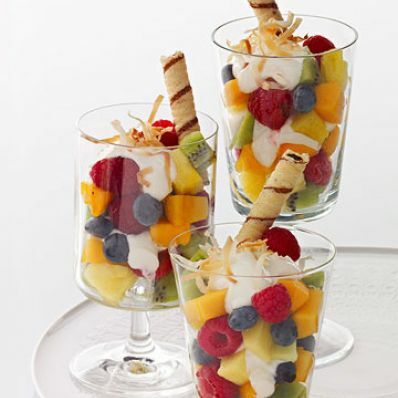 Fill 5 more glasses with remaining fruit, yogurt, coconut and cookies and serve. Per Serving: 249 kcal cal., 4 g fiber, 66 mg sodium, 45 g carb., 7 g Fat, total, 8 mg chol., 5 g sat. fat, 7 g pro.